As one of those American picnic salad staples like egg salad, coleslaw, or macaroni salad, chicken salad is often considered a little boring with its mayo base. 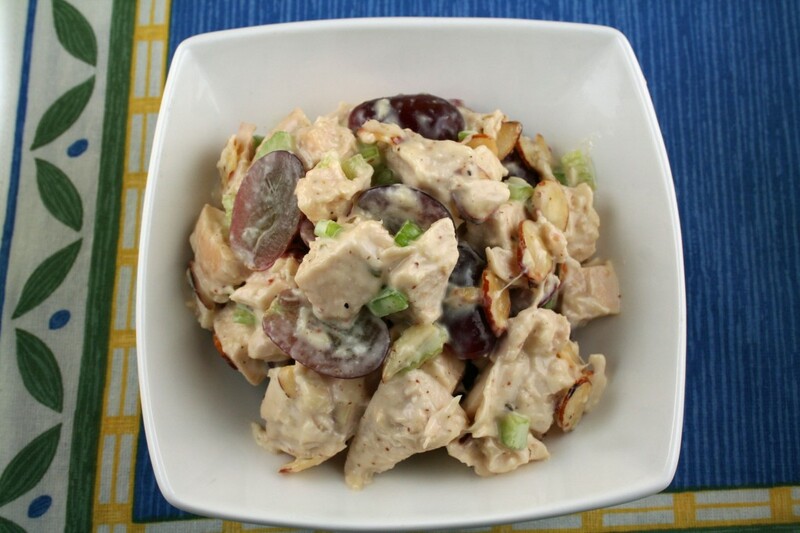 Though happily sandwiched between lettuce and two slices if bread, a good chicken salad can easily stand on its own. This recipe comes from what I consider a good base recipe in “The Art of Good Cooking.” It benefits from small additions and changes to make it homier, interesting, and less institutional. As recommended in the original recipe, I made the mayo base from scratch which gives it a much richer flavor. Red grapes provide the sweet contrast between each bite and the sliced almonds fulfill the craving for a nutty crunch. I also added celery and scallions for a crisp freshness. Simple and perfect for a spring picnic or on-the-go lunch, this is a mayo based chicken salad that doesn’t go out of style. Note: If using store bought mayo, add about 1 teaspoon of lemon juice. The acidity helps balance the fat and richness of the mayo and chicken. Place chicken breasts in a low, wide saucepan. Add enough well seasoned stock just to cover the chicken. Bring to a boil. Lower heat and simmer breasts for just 8 minutes. Remove chicken from stock. When chicken is cool enough to handle, pull off skin and pull the meat away from the bones. 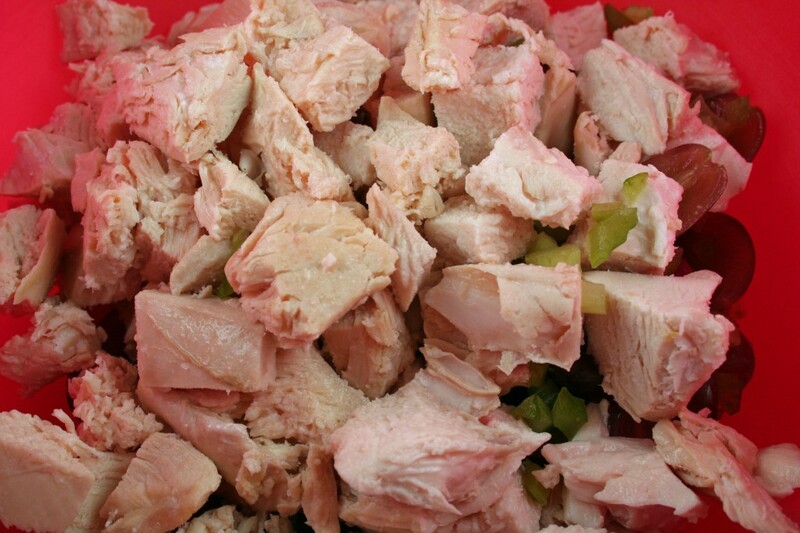 Cut the chicken into 3/4 inch chunks. Place them in a bowl. Add ham (if using), celery, almonds, grapes, tarragon, scallions, parsley (if using), salt and pepper. Add mayonnaise and toss lightly. Taste and correct seasoning. This sounds really good. I love adding dill, pecans, and raisins. Sometimes dried cherries instead. 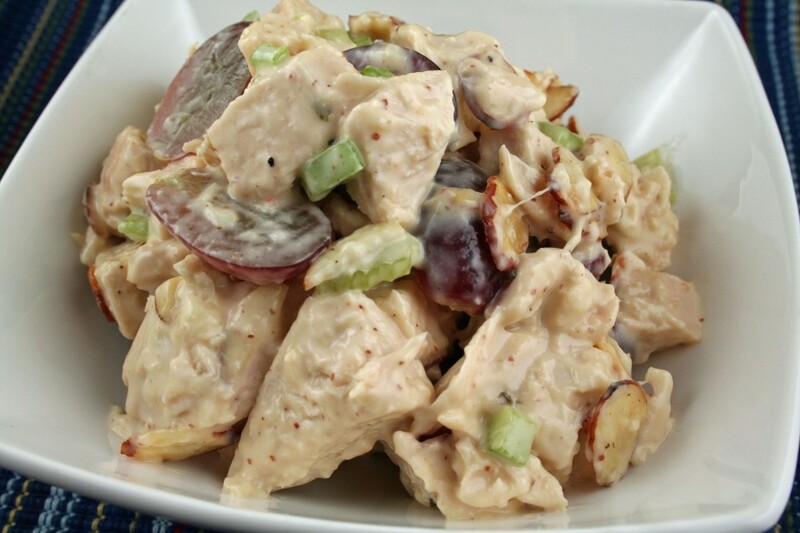 Chicken salad is so charming. Thanks for your thoughts on chicken salad. Do you ever worry about bumping into bacteria in raw eggs in mayonnaise?